On Tuesday night, Donald Trump signed a surprise executive order to keep the military detainment center in Guantánamo Bay open, and pledged to increase the number of prisoners held there. While new prisoners may not arrive for weeks or months, the president’s move is already having profound consequences: Government officials have officially asked George W. Bush to stop renting out Guantánamo Bay on Airbnb. Wow. Things will never quite be the same at Gitmo. 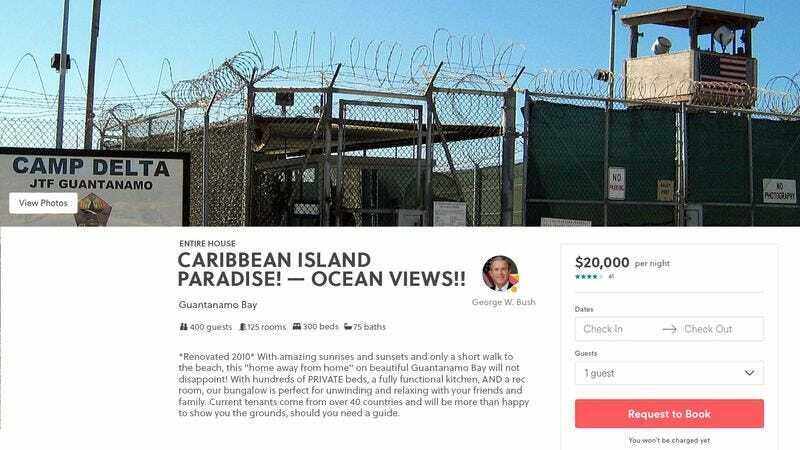 According to sources, representatives from the White House contacted former President George W. Bush this morning and asked him to remove the Airbnb posting, which advertises Guantánamo as a large, spacious island paradise perfect for large vacation groups and families. Given the influx of prisoners that is soon to come, President Bush will reportedly no longer be able to accommodate the 300 beds, 75 baths, and 125 rooms in the 28,000-square-foot extra-legal detention site that he advertises are available. Sadly, the optional walking tour of the grounds where George Bush shows guests the exact places where dozens of Arab men have been held without charge and water-boarded or kept awake for days on end will also have to be shuttered. With more than 41 reviews and an impressive four-star rating from customers, travelers cannot be happy that Trump is preventing them from staying in Mr. Bush’s “prison bungalow” alongside some of today’s most high-profile terror suspects. As of today, the 43rd president of the United States had already taken the listing down, but the site maintains that if reservations to rent out the prison were made before last night, they will still be honored. Mr. Bush will still be permitted to keep his account and his coveted “superhost” status on the site. Sadly, if you were looking for a Cuban getaway for your bachelorette party or family reunion, it looks like it might be too late. Thanks to President Trump’s plan to fill up Guantánamo Bay, it’s time for travelers to start making new plans, and former President George W. Bush to get a new source of second income.